This is Karl Vaters’ most recent book (released March 2018). 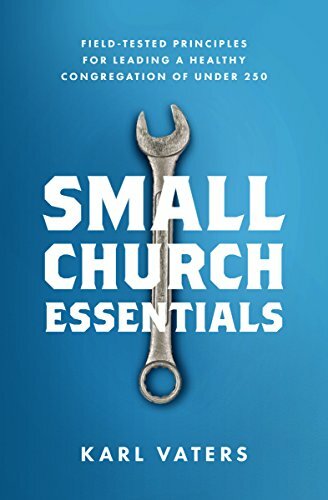 In it, he offers practical insights into how small churches are different than big churches and what that means for pastoring them well. Click here to buy individual copies on Amazon (print or Kindle). For bulk pricing (100+ copies), contact Dave DeHaan at churchdirect@moody.edu or 847-804-2950. The Grasshopper Myth (which has sold over 15,000 copies since being released in January 2012) challenges some of the presuppositions many have held about church growth, church size and church success. It offers real-life examples of the struggles that are unique to small churches and their leaders, and it offers practical suggestions from many sources, including Vaters’ 30+ years of pastoral ministry. It includes a 12-page Discussion Guide, making it perfect for book clubs, church staffs/boards, classrooms and more. What is The Grasshopper Myth? Definition: The false impression that our Small Church ministry is less than what God says it is because we compare ourselves with others. Origin: The Hebrews at the edge of the Promised Land. Symptoms: Lack of vision, faith, courage, effectiveness and freedom. Prognosis: A lifetime of wandering, whining and placing blame. And yes, it is contagious. Treatment: There's a New Small Church in town - a place of hope and healing. We've discovered the benefits of thinking small. And it's got nothing to do with small thinking. We've come to realize that our small size is not a problem to be fixed, but a strategic advantage God wants to use. We're heading out with vision, faith and courage into places God wants us to go. The grasshopper myth (the idea, not the book) is the lie many small church leaders tell ourselves. We see big, bigger and megachurches popping up all over the place, then when we glance back at ourselves we seem like grasshoppers "in our own eyes". That's where the myth starts. Inside us. And that's where it has to end.